Home / Canine Services International Dog Training Blog / Different training approaches. What’s the difference between working 1-1 with a dog training coach, and participating in a dog training class? It’s pretty obvious that there are many differences, with the most obvious being that there are going to be a lot less dogs present! Though we can only speak for ourselves here, and a handful of colleagues, perhaps the biggest difference is the level of attention to detail that involved in tailoring the process to suit the needs of the individual dog, the handler, and the entirety of the situation. It’s the type of attention that a dog trainer running a class is simply unable to give at that time. 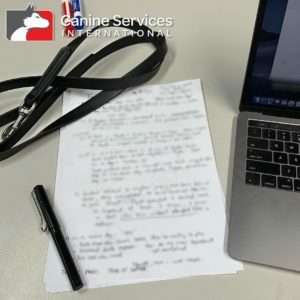 When working with us, it’s often the case that the training approach is different between each of our clients, from dog to dog, handler to handler. Our goals, our milestones, our methods, the order things are taught in…these can all change. So how do we know how to really make that difference work for the dog-handler team? The photo you can see here is one of almost 3 full A4 pages of notes from one of this morning’s Evaluative Consults. We spend 90 minutes getting to know the folks that wish to work with us, as well as getting to know who their dog is. We also get to know not only what their sticking points are, but how it makes them feel, how they deal with things, and what changes they may be prepared to make to get to where they want to go with their dog training or behaviour modification goals.